The problem with most fish oil and omega-3 products on the market today is that they grossly underdose DHA, or they keep the dose of DHA proprietary so you don’t know how much you're getting. 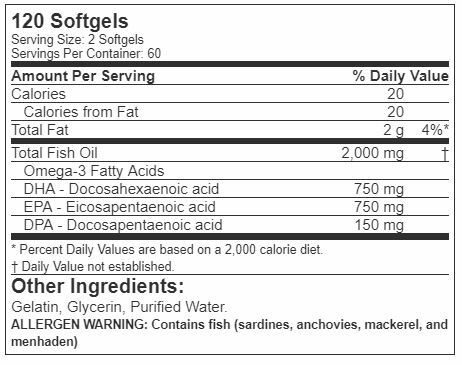 Omega-3 supplements that don’t list the dose of DHA are problematic because you never know if you’re getting enough of this critical omega-3 fat. Taking an omega-3 supplement that provides a low dose of DHA means that you have to take a handful of capsules to get the proper daily dose. For example, if a fish oil capsule only delivers 150 mg of DHA, you would need to swallow 10 capsules per day, every day. That's not only a hassle, but it means that you're ingesting an extra 10-12 grams of fat per day, just to get the 1.5 grams (1500 mg) of DHA you really want. Many fish oil/omega-3 products on the market actually require you to consume 12-15 capsules per day to get 1500 mg of DHA!